The Severe Macaw is one of a group known as "mini macaws." Both adults small green macaws with long tail, blue suffusion on crown, forehead, chin, and area around cheeks near bare face chestnut brown, bend of wing, wrist area, and lesser wing coverts red; underwings at flight feathers dark orange/red, tail red/brown tipped blue. Bill grey/black. Eye yellow. Face bare with fine lines of black feathers. As in adults but with shorter tail and grey eye. Loud; calls include harsh screeches reminicent of braying donkey. 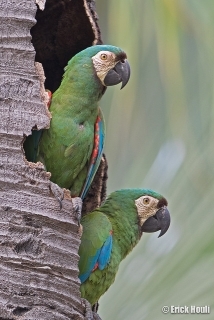 Calls when at rest resemble Blue-and-yellow Macaw (Ara ararauna). High-pitched notes in flight. Uncommon accept US; limited breeding but increasing. Aviary or suspended enclosure minimum length 4m (13 ft), or 3m (9.8 ft) with access to larger flight for part of the year. Cooked beans, boiled corn, sunflower seed - dry, soaked or sprouted; fruit, especially apple, orange, banana; hand-rearing food with hard-boiled egg and carrot ground to crumbly consistency; fresh vegetables such as: carrot, celery, zucchini, peppers, peas in the pod, beans, corn; spray millet, complete kibble for macaws. Likes ropes to swing on, lots of bird-safe chewables (fir, other bird safe woods, vegetable tanned leather), bathing. Seems able to withstand, and even benefit from, selective logging and land clearing. Local declines reported (Cauca Valley, Colombia and W Ecuador). E Panama, Pacific slope of Andes in W Colombia to S Ecuador, and east of Andes from Colombia, E Ecuador and E Peru to Santa Cruz, E Bolivia; north of Amazon river east to W and S Venezuela and Guianas, and south fo Amazon river east to Mato Grosso, south-central Brazil. Introduced to S Florida, US. Up to 1500m (4920 ft). Found in partly cleared and secondary forest, forest edge and open country with trees, humid lowland forest, varzea, swamp forest, palm groves, gallery forest and savanna. Avoids continuous terra firme forest. Diet includes seeds, pulp and fruit; also flowers. Are quiet in the canopy and hard to spot; roost communally. Usually in pairs or small flocks otherwise. March-May, Colombia. February-March, Panama. September-December, Surinam.